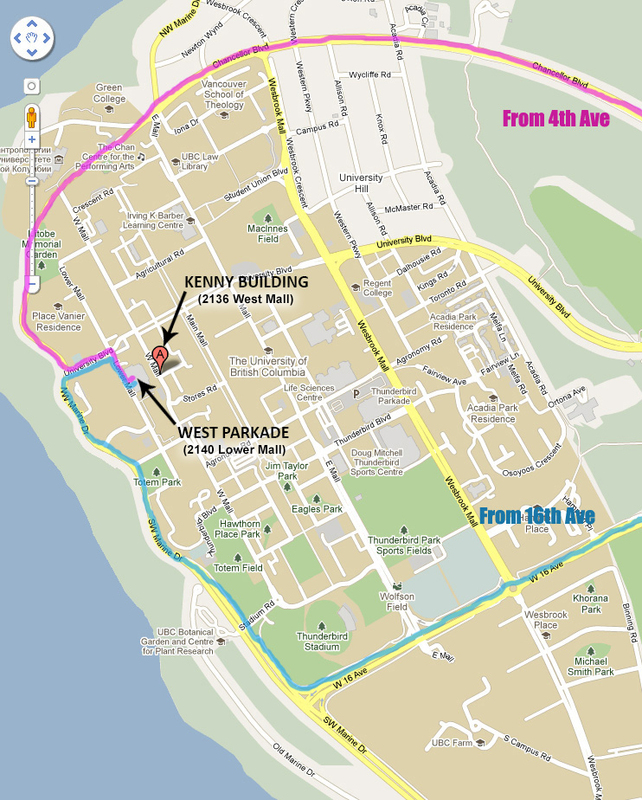 We’re located in the Kenny Building on UBC campus (2136 West Mall V6T 1Z4), and we have reserved parking spaces in the West Parkade across the street (2140 Lower Mall V6T 1Z4). The best way to find us is to take either 4th Ave or 16th Ave to get to UBC. Both of these curve from opposite directions into the same road, Marine Drive, that circles the western edge of campus. 4th Avenue will turn into Chancellor Blvd. Stay on this road and it will turn into NW Marine Drive. Continue down Marine Drive and turn left onto University Blvd (there is a 3-way stop at this intersection). Stay in the left lane as you go down 16th Avenue until you drive past East Mall. After you go past East Mall, switch to the right lane, and merge right onto SW Marine Drive. Continue on SW Marine Drive and turn right onto University Blvd (there is a 3-way stop at this intersection). Please note that due to road closures on SW Marine Drive this summer, it is currently only accessible by 41st Ave (no longer by 49th or 70th Ave). Continue on SW Marine Drive past 16th Ave. Turn right onto University Blvd (there is a 3-way stop at this intersection). Stay on University Blvd for one block. Turn right onto Lower Mall and then, almost immediately, turn left into the West Parkade (a large, concrete structure). If you see a sign indicating the parking lot is full, please ignore it – we have reserved parking spaces for your convenience! Please park on Level 4 in one of the six spaces marked ‘Reserved 24 Hours Early Development Research Group’. It is important to park in these spaces, as they are free for parents to use, and there is no stroller access from the other levels! You will pass several handicapped parking places on Level 4 en route to the reserved spaces, which are located near the doors and walkway. The walkway on Level 4 leads directly across the street to the Kenny Building (Department of Psychology). Enter the Kenny Building at the ground level, and follow the signs directing you to the Centre for Infant Cognition in room 1213. The Kenny building is locked after 5 pm and on weekends. Therefore, if you are scheduled for a visit during these off hours, we will have a research assistant waiting to meet you at the front entrance.